Finding the perfect wedding favor for your big day can be a little difficult. We know that you want to be original without completely breaking the bank, and you likely also want to find something that your guests will actually use. Today we found these precious favors that we wanted to share with you…how cute are these bags of flavored tea with a label that expresses ‘love is brewing’?! If you wanted to spice it up a little you could also attach a precious heart shaped tea infuser! I am loving these ideas! I will send my brides your way! How cute is this!! 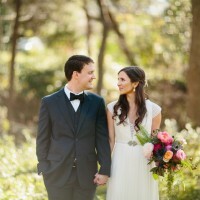 Sending some Dallas Wedding Photographer love your way! See you at Thursday Therapy!! How's the new year goin', sweets? Edible (or drinkable) favors are uber-hot right now. Loved these.